A crisis in available British manpower during the fight for Caen affected allied strategy in Western Europe. A spirit of intense cooperation characterized the months of pre-invasion planning through the June 6, 1944, Normandy landings and subsequent buildup of Allied forces within the lodgment area in France. But after the German western flank collapsed at the end of July, British officials began voicing strong opposition to future Allied strategy. Led by Prime Minister and Minister of Defense Winston S. Churchill, Chief of the Imperial General Staff (CIGS) Field Marshal Alan Brooke and the Allied Ground Forces Commander in France, General Bernard L. Montgomery, British officials increased their efforts in August 1944 to direct Allied strategy. They much preferred a strategy that favored British political interests. The British were determined not to lose their strategic voice as a result of the ongoing and massive buildup of United States Army forces in Europe. Their success in this endeavor has generally been ignored by historians. Most American senior officers serving in General Dwight D. Eisenhower’s Supreme Headquarters were initially committed to making the Anglo-American alliance work. Some senior officers in the British Army displayed a reluctance to cooperate with their American allies almost from the beginning. This was particularly true of CIGS Field Marshal Alan Brooke and his protégé, General Bernard L. Montgomery. The unspoken assumption had been that after a decision was made by Roosevelt and Churchill or at the Combined Chiefs of Staff level, the generals in France faithfully carried out their bosses’ wishes. This simply was not true. British intransigence over Allied strategy in Europe took the Americans completely by surprise. Allied strategy and its political implications for postwar Europe were a far greater concern for British leaders than for the Americans. This was understandable. Both before and during the war the British government had been intimately involved in treaty negotiations with many European governments and actively sought a return of the old states of Europe to their prewar boundaries and political status. The Americans had no prewar treaty with any European country. Prior to American entry into the war, isolationist sentiment in the United States had even made it difficult for President Roosevelt to ship war supplies to the Western democracies. Although the Japanese attacked the United States at Pearl Harbor, the Americans agreed with British planners that they should make their main effort in Europe against Hitler’s Germany. A strategic planning conference between senior officers in the British Army and the U.S. Army was held in Washington, D.C., from January through March 1941. Although it was not always possible, the Americans tried to separate military strategy from political considerations. Strategy was the determining factor in most U.S. military operations; political concerns would be addressed by the president or his advisers at the end of the war. Since the Americans would be the major contributors to the Allied effort in France, President Roosevelt convinced Prime Minister Churchill that it would be fitting to have an American as the supreme Allied commander for the invasion of France. The commander Roosevelt selected with Churchill’s approval was General Dwight D. Eisenhower. The Allied Combined Chiefs of Staff based in Washington, D.C., directed General Eisenhower to “enter the continent of Europe, and, in conjunction with the other United Nations, undertake operations aimed at the heart of Germany and the destruction of her armed forces.” The wording was very simple and straightforward. Eisenhower’s job was to destroy the German Army. Off the record, General George Marshall gave Eisenhower an additional caveat; he was to beat the Germans and get along with his British allies. The Americans tried to avoid involvement in European politics. U.S. Army Chief of Staff General George C. Marshall “just did not want to get into politics, and he kept warning Eisenhower to stay away from them. Politics was the business of the arbiter in the White House.” Marshall would later advise Eisenhower that he was opposed to letting General George Patton’s Third Army drive into Prague, the Czech capital, and that he did not favor sacrificing American lives for “purely political reasons.” Eisenhower followed Marshall’s advice; he made the same decision not to commit Allied forces to occupy either Prague or Berlin and saved thousands of soldiers’ lives. Prime Minister Churchill agreed to a second Allied invasion in Southern France, Operation Dragoon, at the Teheran Conference in late 1943. British agreement for Dragoon was secured only under great pressure from Soviet Premier Josef Stalin and President Roosevelt. They were unhappy because Operation Dragoon forced a reduction in the number of divisions and landing craft available for the Allied war effort in Italy and the Mediterranean Theater. Most of the senior officers in the Mediterranean Theater were British. British Mediterranean strategy had dominated Allied discussions since mid-1942, and they were determined to resist any plans that seemed to compromise the importance of their theater. The Allied campaign in Italy was a continuation of the Mediterranean strategy that the Americans had joined in November 1942 with the invasion of northwest Africa, Operation Torch. Allied operations in the Mediterranean were an example of British peripheral strategy wherein the weaker Allied armies engaged only the edges of Germany’s military power. The Allies hoped to retain strategic flexibility while taking advantage of German weaknesses wherever and whenever they could be exploited without exposing themselves to defeat in a major land battle with superior enemy forces. An invasion of northwest France in 1943, which George Marshall and his advisers had fought for, would have led to almost certain disaster. By postponing the invasion of France until 1944, the British had saved their American ally from the prospect of a tragic and often unacknowledged defeat. An Allied invasion of France in April, May, or June 1943 would have drawn new German PzKpfw. V Panther and PkKpfw. VI Tiger Tanks west to the invasion area rather than east to Kursk where they went into action against the Soviets during Operation Citadel on July 5. The Allies would have had to face the new generation of German tanks without the complete air superiority over the battlefield they enjoyed in 1944, a daunting task. President Roosevelt insisted that his armies must go into action somewhere in 1942 against the Germans to take pressure off the Soviets fighting on the Eastern Front. There was also an election in the United States in November 1942, but Roosevelt’s desire to have Torch scheduled just prior to the November elections did not pan out. Although they had agreed to Operation Dragoon at Teheran, it was not an operation the British were prepared to support. In early August 1944, Churchill raised his opposition to Dragoon in a series of meetings with General Eisenhower. The prime minister blustered and bullied his American guest. He threatened to go the king and “lay down the mantle of my high office.” He cried and accused the Americans of becoming bullies, of using their overwhelming military power to force concessions from the British. The meetings lasted for hours. Eisenhower was deeply moved by Churchill’s emotional distress, yet he could not oppose an operation that had both President Roosevelt’s and George Marshall’s firm support. Their final meeting over Dragoon was on August 9, 1944, barely one week before the operation was to begin. In politics the saying goes, “Follow the money.” In military disagreements between Allies, the overriding issue was often command and control of strategy. The British had agreed that Eisenhower would take command of Allied ground forces when Patton’s U.S. Third Army and General H.D.G. Crerar’s Canadian First Army were activated in France. The British had agreed to it, but they did not like it and they never accepted Eisenhower in that role. Throughout the war in Europe, the British continually sought to undermine Eisenhower’s command authority so they could propose one of their own generals as Allied ground forces commander. As late as February 1945, British delegates at the Yalta Conference sought to compromise Eisenhower’s authority to command Allied ground forces in Europe. The U.S. Third and Canadian First Armies were activated on August 1, 1944, but Eisenhower declined to accept the role of commander at the time citing difficulties in getting communications established for his new headquarters at Granville. This was a ruse intended only to soften the blow to British national self-esteem. British spirits were depressed after Montgomery’s Operation Goodwood in mid-July failed to meet expectations during efforts to capture the French town of Caen. The American breakout victory during Operation Cobra a few days later seemed to invite the kind of unfavorable comparison between the British and United States armies that Churchill had hoped to avoid. During Operation Goodwood on July 19, 1944, a British M4 Sherman tank passes the smoking hulk of a destroyed German PzKpfw. IV medium tank. 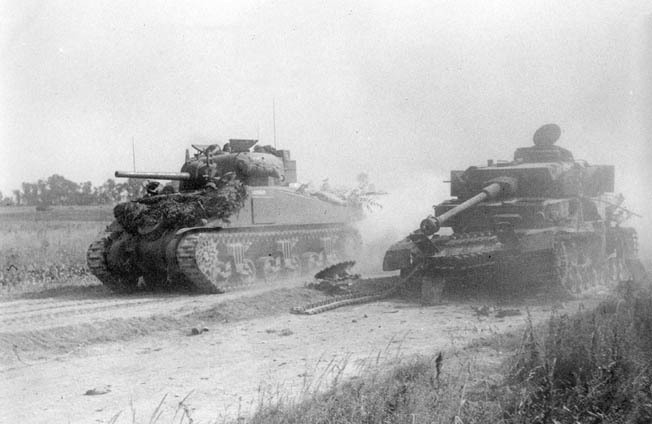 Controversy lingers as to the true purpose of Operation Goodwood, the outright capture of Caen and an attempt to draw German forces away from the Americans, who broke out of the Normandy beachhead during Operation Cobra launched a week later, or a concerted effort by 21st Army Group to achieve its own breakout. Eisenhower knew that any change in the command arrangement that might be interpreted as a demotion for Montgomery would be deeply resented in Britain. He sought to take some of the sting out of Montgomery’s demotion to army group command by postponing it for one month. Eisenhower’s aide, Harry Butcher, made this entry in his diary on July 31, 1944: “Just how personally Ike has taken command of the ground forces is not yet clear to me. Each time I have suggested he do it, he has belligerently countered, ‘Then they will have to get someone (else) to be the Allied Commander.’” Eisenhower clearly saw a difference in the role of ground force commander and his own role as supreme Allied commander. While he believed that the ground force commanders were free to argue military priorities based on national or political concerns, he considered that his own job of supreme commander should remain politically neutral. After the war, Eisenhower wrote, “In a theater so vast as ours each army group commander would be the ground commander in chief for his particular area; instead of one there would be three so-called commanders in chief for the ground and each would be supported by his own tactical air force.” Eisenhower never envisaged himself as one of those three ground commanders in chief. After news of the impending change in command had been picked up by correspondent Wes Gallagher, it was carried in the U.S. Army newspaper in Europe, Stars and Stripes. Just as Eisenhower predicted, the British howled in protest. The Allies were winning a great victory under General Montgomery in Normandy. Why, the British people asked, did the Americans want to demote him now? Reacting to British criticism, Supreme Headquarters Allied Expeditionary Force (SHAEF) truthfully denied that the change in command had actually taken place without explaining that it would occur within a few weeks. This statement produced an angry reaction in the United States where it was pointed out that the British enjoyed all three major operational commands of Allied land, sea, and air forces. They wondered in print what happened to Eisenhower and the other American generals in France. President Roosevelt saw a potential political crisis developing in the United States just prior to the 1944 presidential elections. He told General Marshall to “tell Ike to get over there….” This was one of the few times Roosevelt intervened in military affairs in the European Theater. On September 1, 1944, doing as he was ordered, Eisenhower took nominal command of Allied ground forces, but it was not a command he was prepared to exercise. All of this was perfectly true. Eisenhower’s name appears at the top of every organizational chart ever produced that sought to explain the Allied command structure in Europe. Eisenhower certainly enjoyed all the trappings of power. Everyone called him the boss. He looked like the boss. He had the rank, although after September Montgomery, as a British field marshal, nominally outranked him. He had the office and eventually nearly 15,000 people would work for him. Unfortunately, if one looks at what happened instead of what was written about it later, it quickly becomes apparent that the words “approved” and “command” have very different meanings. Although there can be little doubt that Eisenhower was the boss, he would exercise his command with great discretion and a firm commitment to the Anglo-American alliance. British intransigence would ultimately cripple his ability to command Allied ground forces. Neither Roosevelt nor Marshall put much political pressure on Eisenhower to favor American interests in Europe. General Marshall always gave his subordinates great latitude in the performance of their duties. This allowed Eisenhower to give General Montgomery and Alan Brooke most of what they demanded in the fall of 1944 without facing criticism from Washington. After the invasion, it did not take long for the Germans to demonstrate their fighting abilities. The German soldier was an excellent defensive fighter. A series of British offensives on the eastern Allied flank aimed at Caen failed to take the town. As June became July, British losses in Normandy were mounting. Caen, Montgomery’s D-Day objective, remained beyond his grasp. The British War Office was forced to inform its commanders in France that they were running out of men to replace their battlefield casualties. There were two obvious solutions to the British manpower crisis. One, they could frankly admit their manpower dilemma to Eisenhower, giving up their claim to an equal share in Allied command assignments. This would enable the British to protect their fragile army by limiting offensive operations on the eastern flank and leave the Americans free to develop an Allied strategy preferred by George Marshall and the Combined Chiefs of Staff in Washington. Neither of the obvious solutions to their manpower crisis appealed to British leaders. So they tried to hide their problem by ignoring it. The prime minister strongly believed that the political future of the British Empire, which he had sworn to protect, was tied directly to the public’s perception of the British Army sharing the Allied victory in France. Churchill and his military chiefs would go to great lengths to hide the limitations the manpower crisis imposed on the British Army. He had not become, Churchill once famously said, “The King’s First Minister in order to preside over the liquidation of the British Empire.” Churchill and his generals were so successful at obscuring the British manpower dilemma, at least in part, because of the intimate cooperation they received from an American, General Dwight D. Eisenhower. Privately, Churchill was willing to admit his manpower problem to Eisenhower. British intelligence officer Maj. Gen. Kenneth Strong remembered that he was “with Eisenhower in his caravan on one occasion when Churchill telephoned him from London. Churchill’s request was that if possible Eisenhower should avoid too many British casualties; British losses had been severe….” This was true. Churchill wanted to obscure the problem in order to maintain the public’s belief that the Second British Army remained a viable independent military force capable of sustained offensive operations, just like the Americans. This proved not to be the case, but historical references to it are hard to find. 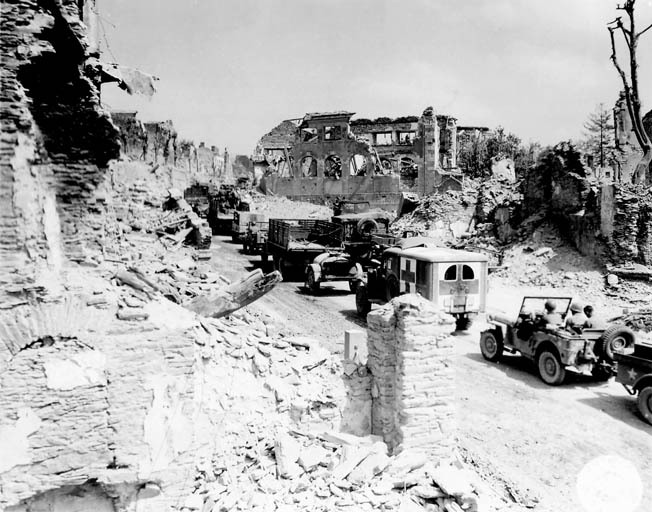 An American convoy including an ambulance moves through the shattered French town of St. Lo following the breakout from the Normandy beachhead. Following heavy losses and a failure to take Caen for weeks, Montgomery asserted that a holding action was part of the plan to draw forces away from the Americans. Montgomery agreed with his superiors in London. For morale reasons he believed the manpower crisis should remain concealed from public scrutiny; but the manpower shortage was also having a negative impact on his offensive operations and therefore on his reputation as a military commander. While he clearly expected the Second British Army to gain more ground at Caen, he was forced to adjust his plans as German defenders inflicted severe casualties on his infantry divisions. Royal Air Force officers have strongly disputed Montgomery’s claim that the ground at Caen was of no importance at all. This was the ground they had been promised on D-Day or shortly thereafter and which Montgomery still had not taken by July. This was ground Allied air forces desperately needed to move their squadrons from England to France, dramatically increasing their operational range. Addressing the British manpower shortage in Normandy was going to be difficult no matter what decision was finally made. The government of Winston Churchill decided to keep the manpower crisis a secret for political reasons. Author Carlo D’Este wrote, “Churchill … was anxious to avoid any reduction in the strength of 21st Army Group during the final victory over Germany.” Churchill believed that having fewer British divisions in Europe would lessen the impact of Great Britain’s strategic voice in discussions with their Allies. The British manpower problem directly influenced Montgomery’s tactical operations in France. His reputation was under attack both in the press and at Supreme Allied Headquarters. But he was not able to press home his attacks in the Caen sector without inflicting severe damage on the Second British Army. The solution Montgomery finally adopted was to fabricate a logical reason for his failure to gain ground at Caen other than the obvious manpower crisis. As the end of June arrived with Caen still beyond his grasp, Montgomery uncovered an excellent reason for his failures. He phrased it so eloquently and so logically that historians have been wrestling with it since the end of the war. Montgomery began his disinformation campaign by claiming that it was not important either to take Caen or to gain any more ground in the Caen sector. The important thing on the eastern flank, Montgomery said, was to remain well balanced, to avoid a setback, and to trick the Germans into deploying the bulk of their armor at Caen to make things easier for the Americans on the western flank. This, Montgomery claimed, had always been his plan. While he had not gotten Caen yet, he dismissed that as not very important. He had already accomplished the more important task of attracting the bulk of the German armored divisions and their heavy artillery to his eastern flank. Chester Wilmot wrote The Struggle for Europe in 1952. Wilmot spent the war attached to Montgomery’s 21st Army Group headquarters and had grown quite fond of the little British field marshal. He was so happy to discover how Montgomery had tricked the poor Germans into reinforcing the Caen sector that he repeated it over 30 times in his book. The Allied officer in charge of pre-invasion planning was the gifted British Lt. Gen. Sir Frederick Morgan. 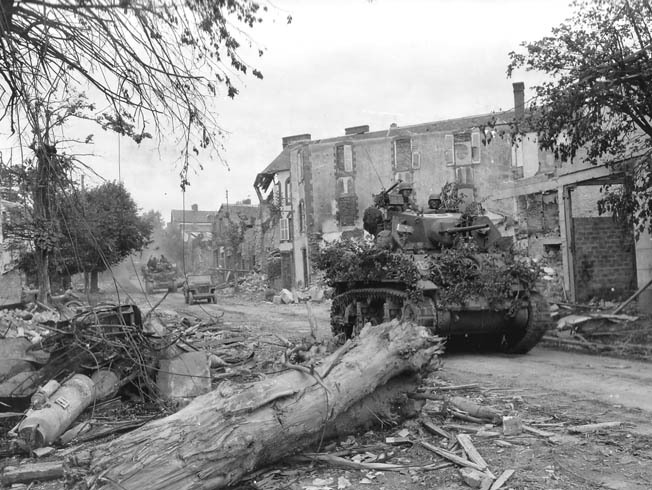 After the war, General Morgan wrote, “Above and beyond everything it was evident from the first moment that the objective of supreme importance was the town of Caen with its command of communications…. With Caen, the key, firmly in our grasp the puzzle seemed to resolve itself with a tenable logic.” Occupying Caen would also clear the short route to Paris, and northeast of Falaise the ground opened up to the central French plain, excellent tank country. The Allied western flank occupied by the Americans was dominated by rivers, swamps, small streams, and the worst of the Normandy hedgerow country. British military historian Michael Reynolds described one German attempt to launch an armored attack through the hedgerows (bocage): “The initial part of their route was through bocage with high banks along the narrow roads, there was no chance of deploying cross-country and visibility was restricted, even without the fog, to less than 100m. They would therefore have no chance to use their splendid tanks guns effectively.” German vehicles, including tanks, were blocked from moving off the roads by 10- to 15-foot-high hedges. If Allied fighter bombers destroyed the first and last vehicles in a column, the entire column was instantly immobilized and became sitting ducks. It was no great surprise to anyone that the Germans committed the bulk of their armor and heavy artillery in the Caen sector. Limiting the magnificent 88mm antitank gun, the PzKpfw. V Panther, and PzKpfw. VI Tiger tanks to operations where their fields of fire would often be 100 meters or less by deploying them in the American sector would have been a gross misuse of these fine weapons. No reasonable person could argue otherwise. Yet this was precisely the argument Montgomery put forward. The British press and public eagerly consumed any information from their famous general that explained why his army had failed to gain ground in Normandy. Montgomery’s questionable explanation was quickly accepted as established fact. His success at fooling the Germans and the British public about Caen has become part of the Montgomery legend. The Americans, however, were leery of any Montgomery scheme that claimed to sacrifice British lives for their benefit. Hastings also wrote, quite correctly, that Montgomery had good reason for fabricating an untruthful account of the events near Caen. As the senior British officer in France, Montgomery was responsible for the morale and fighting spirit of the British Army in France. The German soldier was good at his craft, better than the Allies expected. His exceptional combat skills were enhanced by the superiority of his weapons and the excellent leadership provided by his NCOs and junior officers. The unpleasant truth was that neither the British nor American soldier was the equal of his German adversary on the battlefield. As the ranking British officer in France, Montgomery was fully justified in obscuring this painful truth. But Montgomery created a problem for himself when he repeated the same misinformation to his superiors. Hastings wrote, “Montgomery served … his men very well by maintaining his insistence … that all was going according to plan. But he did himself a great disservice by making the same assertions in private to Eisenhower, Churchill, (Deputy Allied Supreme Commander Arthur) Tedder and even his unshakeable patron Brooke.” What had begun innocently enough as a white lie precipitated by the British manpower crisis and intended to protect the morale of British soldiers would grow into an Allied misunderstanding that would shake the foundations of the Anglo-American alliance. Eisenhower understood the British problem completely, and he phrased it correctly in letters to Montgomery. As long as the British wished to remain co-equal strategic partners with the Americans, “honors and sacrifices must be equally shared.” On July 7 Eisenhower wrote to Montgomery, “I am familiar with your plan for generally holding firmly with your left, attracting thereto all of the enemy armor, while your right pushes down the Peninsula and threatens the rear and flank of the forces facing Second British Army.” In the same letter Eisenhower described the horrible ground the Americans would be fighting through and acknowledged Montgomery’s manpower problems by offering a U.S. armored division for offensive use on Montgomery’s left flank. Montgomery’s suggestion, popular among British historians, that Eisenhower did not understand the finer nuances of his decision to hold with his eastern flank at Caen while he attempted to break out with the Americans on the western flank is simply not borne out by the historical evidence. Eisenhower not only understood Montgomery’s plans completely and said so in his letters to the British commander, he often repeated Montgomery’s own words back to him. Eisenhower did his best to help Montgomery see the political requirements of their wartime alliance. His patience with Montgomery’s failure to understand their mutual problem (making the Alliance work) was nearly endless, but eventually there were limitations. While Churchill and Eisenhower were urging General Montgomery to make greater offensive efforts at Caen, the British War Office was trying to head off a manpower crisis, sending the adjutant general, General Sir Ronald Adam, to France in early July to warn Montgomery and Dempsey [General Miles Dempsey, commander of the British Second Army] about the manpower problem. A camouflaged American M3 Stuart light tank leads a column of vehicles along a dirt road in the town of St. Lo following the successful American breakout of the Normandy beachhead during Operation Cobra. Montgomery was forced by these unusual circumstances to obscure the truth about his dilemma at Caen. Montgomery’s behavior may have compromised the Anglo-American alliance were it not for the generous personal support he received from his American boss. Then and later, General Eisenhower kept his American subordinates quiet about Montgomery’s untruthful boasting to the press and the very real British manpower crisis. After he decided to hold down British casualties at Caen by limiting his offensive operations, it became essential for him to admit this to the Americans so they could adjust their plans accordingly. Unfortunately, Montgomery never told the Americans about his change in plans. Instead, his continued deception and boasts to the press that “everything was going according to plan” only made the Americans mad. Eisenhower was completely forthright with both Winston Churchill and General Montgomery concerning American distrust of Montgomery’s behavior at Caen. But he never allowed Montgomery’s behavior to become an issue in the press; he covered it up. Tedder, from the Royal Air Force, thought Eisenhower was going too far in support of Montgomery: “I told Eisenhower that his own people would be thinking that he had sold them to the British if he continued to support Montgomery without protest.” Yet this was precisely what Eisenhower did. However, eventually even Eisenhower’s patience wore thin. By the end of July, there was a movement afoot at Supreme Allied Headquarters to fire General Montgomery, the Allied ground forces commander and the most popular general in the British Army. His critics said that Montgomery’s slow-motion offensives and his inability to conduct large-scale maneuvers at Caen had produced a stalemate in Normandy. His critics figured that the way to break the stalemate was to fire Montgomery and replace him with someone who understood offensive warfare. The plan to fire Montgomery entered its critical phase just as the Americans broke the German line at St. Lo. With the American victory and Brooke’s unshakable support for Montgomery, the plot to fire the most popular general in the British Army died an inglorious death. Churchill had visited Montgomery in Normandy on July 21 and was satisfied that his plans for the battle were sound. But there can be little doubt from the historical record that in late July 1944 both Tedder and Eisenhower would have preferred to remove Montgomery from command of Allied ground forces. Of course, such an event did not occur. Tags Allied Expeditionary Force, Allies, Battle of Singapore, Bernard Montgomery, british military history, Caen, D-Day, Dwight D. Eisenhower, European Theater, Franklin D. Roosevelt, General George C. Marshall, General George S. Patton, General Sir Alan Brooke, General Walter Bedell Smith, Japan, Japanese, Mediterranean, Miles Dempsey, Normandy, Operation Citadel, Operation Dragoon, Operation Goodwood, Operation Overlord, Operation Torch, Royal Air Force, SHAEF, Sherman Tank, Tiger Tank, United Nations, Winston Churchill, Yalta Conference.